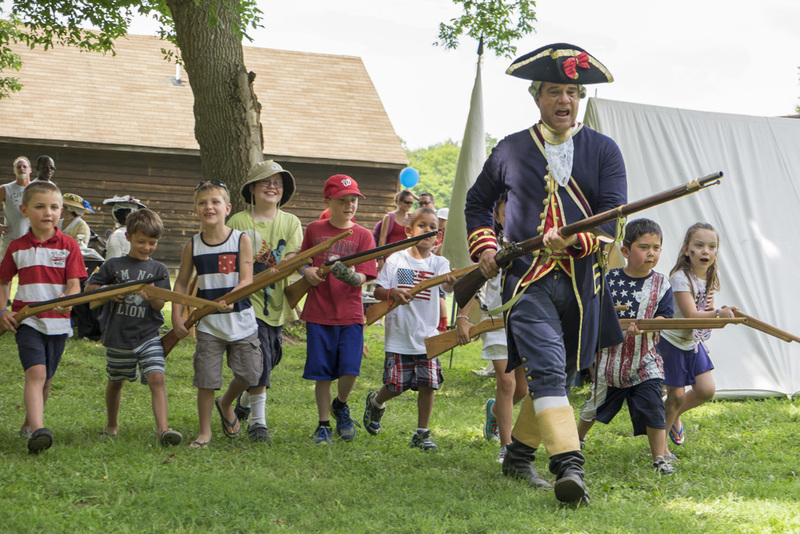 Scenes from last week’s Independence Day celebration at George Washington’s Ferry Farm! 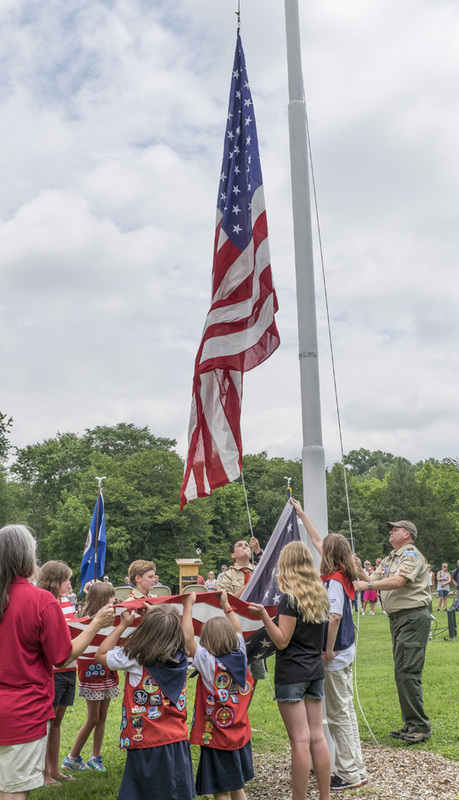 Read “Celebrating the Fourth and what makes America great” by Kristin Davis for The Free Lance-Star about the Ferry Farm and other area celebrations. Two young gentlemen meet General George Washington portrayed by Greg Fisher. Visitors arrive to Ferry Farm on one of Fredericksburg’s iconic trolleys. 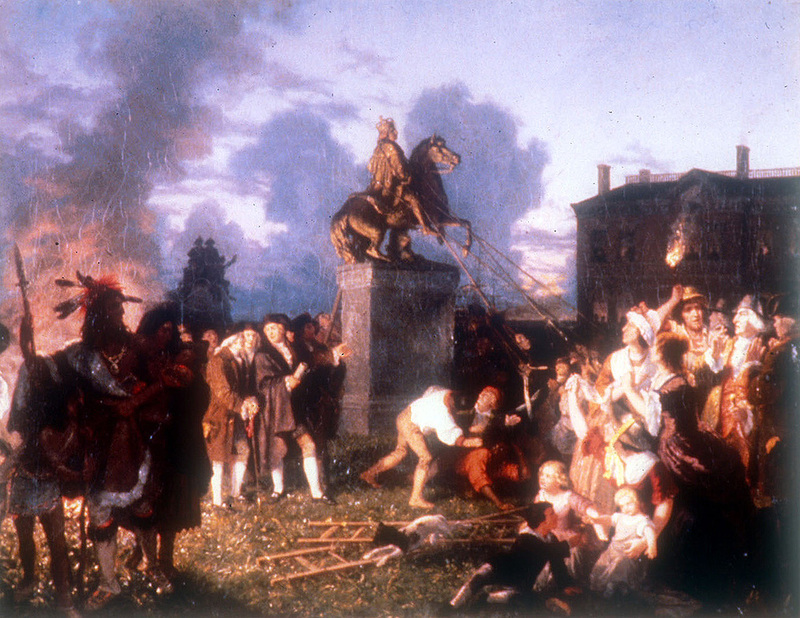 Adding their John Hancocks to the Declaration of Independence. A group begins their tour of the Washington house replica. Living historians ready to demonstrate butter churning and other foodways. Building a sand George Washington house. Theater performance showing 18th century courting customs. Archaeologist discusses artifacts recovered from an 18th century kitchen that burned down at Ferry Farm. Parading to the flag retirement ceremony. Why Did Yankee Doodle Call a Feather “Macaroni”? A vintage Independence Day postcard with the beginning lyrics of “Yankee Doodle”. In honor of the Independence Day, I want to talk about a pressing question I had as a child pertaining to one of our most popular patriotic songs “Yankee Doodle”. We all know the first verse. The question is why did he call a feather in his cap “macaroni”? Macaroni does not refer to the tasty cheesy pasta dish that we all love and know. It refers to an elaborate short-lived fashion trend in England at the end of the 18th century. The trend started with upper-class youths who returned from their Grand Tours of mainland Europe with a great appreciation for continental style and taste. They brought back the luxurious fabrics of the French as well as the pasta dishes of the Italians, thus macaroni was used to refer to the fashion trend. The macaroni style consisted of a tight-sleeved coat with short skirts, waistcoat and knee breeches. Macaroni emphasized pastel color, patterns and ornamentation like brocaded or embroidered silks and velvet. On their head, they wore tall wigs with a rising front and “club” of hair behind that required an extensive amount of pomade and powder. This wig was usually garnished with a large black satin wig-bag trimmed with bow. The feet were clad in red-heeled slipper-like leather shoes with decorative buckles of diamond, paste or polished steel. Additionally, as much ornamentation as possible was added with large floral nosegays, hanging watches, swords and tasseled walking sticks. To be “macaroni” was to be sophisticated, upper class, and worldly. An elite figure marked by the cultivations of European travel, wealth and taste. So what did the British troops, who first sang the song about their colonial cousins, mean when they said that Mr. Yankee Doodle stuck a feather in his cap and called it macaroni? The song was not meant to be a compliment but rather a joke. A “Yankee Doodle” was a simpleton who thought that just putting a feather in his hat would make him macaroni or fashionable when, in reality, he was just a country bumpkin. He lacked class, could never mingle in high society, and was too simple to even realize it. It was obviously a broad generalization of Americans because in the colonies there was a broad range of fashion. America didn’t have a global metropolis like London but wealthier colonists like Historic Kenmore’s Fielding and Betty Lewis could afford the luxurious imported fabrics and trendy ornamentation. Even with the delay in news from England the wealthy always tried to follow the a la mode styles. The average colonist would probably not have had a pastel silk waistcoat or stripped knee socks, however. For them, linen, wool, cotton and linsey-woolsey were all common clothing fabrics in more natural or sedate colors. An average person may only have had 2 or 3 outfits so durability was preferable to style. What seems like just a silly sounding verse in a marching tune actually illustrates how the British viewed and had always viewed the colonies. They looked down on the overseas colonies; after all if it wasn’t for the support of the Crown the initial colonial settlements might not have survived. They felt that the American colonists owed them a great deal for protection, for purveying their culture, for providing them with manufactured goods. So, if the British were insulting Americans in “Yankee Doodle”, why is it such a common American patriotic song now? Why would Connecticut even make it their state anthem? As is often the case with insults leveled at a supposed inferiors by people who sees themselves as superior, the colonists appropriated the negative image of a Yankee Doodle and gave it a positive meaning. No longer was this motley “macaroni” viewed as a garish fool but rather became a symbol of a homespun American identity. One of six scenes from the story of Yankee Doodle showing an Uncle Sam figure tipping his feathered top hat to the departing British represented by Britannia and the crowned lion and unicorn on King George III’s coat of arms. This scene and five others were pasted together to form a long panoramic strip on a late 19th century children’s toy made by McLoughlin Bros. and illustrated by Thomas Nast. Credit: Beinecke Library, Yale University. America was a place where your status in society was based on merits of work, enterprise, and earned wealth. Your value didn’t come from an inherited title or a fancy ensemble but rather from your own abilities and hard work. In America, anyone could indeed stick a feather in his cap and rightly call it macaroni. The British could keep their macaroni men, Americans would rather be a Yankee Doodle. One week from today, celebrate Independence Day at George Washington’s Ferry Farm! Tour the replica Washington house, learn about this summer’s archaeology dig, enjoy a patriotic flag retirement ceremony, interact with colonial and Civil War reenactors as well as members of the Patawomeck tribe, listen to festive music, view living history demonstrations and theatre performances, and participate in educational programs, crafts, games, and hands-on activities for the whole family. Check out these photos from last year’s celebration! Important event details are after the photos. Shuttles run between the Eagles Lodge and Ferry Farm. 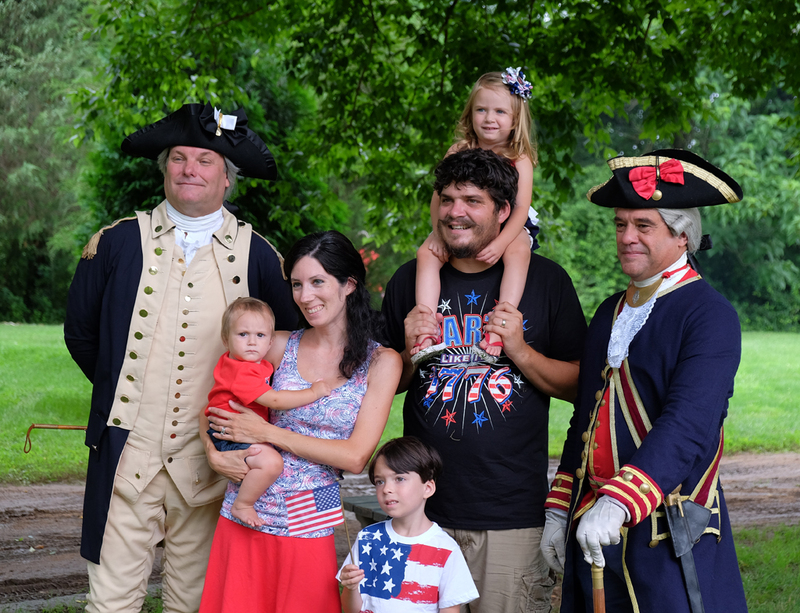 Scenes from last week’s Independence Day celebration at George Washington’s Ferry Farm! George Washington (Greg Fisher) greets young visitors. Young recruits are led in a militia drill by Paul Limerick. A graceful catch of the Graces hoop. Working hard at the barrel roll! Audience watches Fielding Lewis propose marriage to Betty Washington during a theater scene. Audience members recreate the painting of Washington crossing the Delaware. Soap made by Elisa Gale goes from the cauldron into molds to cool and harden. Artisan Bill Jenkins uses a draw knife to craft part of a Windsor chair. Congressman Rob Wittman speaks during the annual Flag Retirement Ceremony. Boys Scouts and American Heritage Girls lower the flag being retired. The new flag is raised as rain begins to fall. Scenes from this past weekend’s Independence Day celebration at George Washington’s Ferry Farm!